Dead on, Aristotle! Some of the most naturally gifted people make terrible teachers. They have a hard time understanding and explaining what they do intuitively. A teacher, in contrast, is able to do and explain. At ClickerExpo our faculty members both do and teach. In fact, it should be tattooed on our arms as a hallmark of the program! When faculty members talk specifically about teaching others, it’s worth listening. This year we have more than 20 courses that address the challenges of teaching others and that provide the kind of insight and breakthroughs you can only get at ClickerExpo. You don’t have to be an Einstein or Aristotle, just someone who teaches. Training is a unique combination of science and practice. When the two are integrated to teach the public about training, there can be a terminology conundrum. At times, the science vocabulary is too complex for the average pet owner. Often, the public’s understanding or use of a term does not match the way it is used in the scientific community. How do we as trainers handle those challenges? Do we understand fully the meaning of these terms? At first glance, the use of accurate science and the practice of teaching clients may seem at odds, but they don’t have to be. Join Ken Ramirez for what should prove to be an interesting and enlightening discussion. The communication trend of this decade is communicating with brevity. Can you write in 140 characters or less? While you are busy practicing the written short form, you may have paid too little attention to brevity in the spoken form—particularly if you are a teacher. Speaking is a key component of almost all teaching and instruction. And, speaking is reinforcing. When you speak, you feel you are delivering value to the clients paying for your time. The truth is, we talk more than we should. It is a challenge to sift through an entire lifetime of acquired knowledge and serve it so that it can be gobbled up, mastered, and applied! Teachers need to build and practice this skill. In a Learning Lab format, join Theresa McKeon and learn to make your instructions more clear. The results will be both better skill-acquisition and less teacher stress. What about when you are the learner being taught? Help your teachers help you learn! Help Your Teacher Help You - Part I & Part II. If you are new to group-class teaching, this course is a must. At first glance, teaching group classes may seem fairly easy, and not needing much preparation. Just get a group of dog owners together and teach some lessons, right? Not so fast! If you want people (and their dogs) to love your class, and you want to love teaching it, there are some important elements that successful group classes have in common. Join Laurie Luck and go behind the scenes to learn about the structure and management of a successful group class. A hot concept in interactive learning is “gamification,” a fancy of way of describing the process of making learning (or any “work”) as much like a game as possible. The idea is that when learning is fun, learning ”sticks” and learners become more enthusiastic students. How far have you taken the concept to the teaching you do with your groups? Are your people having as much fun as the dogs? Join experienced and highly successful teacher Terry Ryan to learn to “gamify” your class, simplify your teaching, and garner broad smiles to go along with those wagging tails. The games stress education rather than competition, and fun rather than chaos. Join Terry and get some game. Where is your focus and energy while you teach? Theresa McKeon will help you look away from the dog and more toward your client. You’ll be surprised by what you see—maybe displacement behavior in your human! Who wants that? No one does. So, look away and, paradoxically, what you need to see comes into focus. Are you giving clients what they need to succeed in the world they live in? Life is messy! Teaching should be centered on the client, but, too often, trainers offer an idealized version of the “textbook” execution of dog-training exercise. If you put client needs front and center, does teaching look very different? Join Laurie Luck and see how different client-centric teaching can be! Games can be highly effective teaching tools for dogs with reactivity. 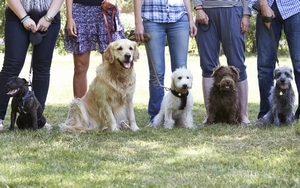 Emma Parsons teaches group reactive-dog classes, and her games are a vital part of that experience. Games can recreate safely a number of the challenging situations that pet owners and dog-sport enthusiasts face with their dogs in ordinary life. Activities like standing in a line at the training facility to pay for dog treats, or waiting in the queue before an agility run, pose special problems if your dog has not been taught to wait calmly amid lots of people and dogs in a noisy environment. In this course, you will see games that Emma uses and walk away with helpful explanatory handouts. Trainers wish that everything that is said to clients becomes internalized. However, trainers sometimes get feedback from a client reporting that he/she couldn’t recall the management and training exercises that were taught, or that the dog does not do well in the home environment. These situations increase owner and animal stress and result in a lack of practice in between scheduled appointments. These obstacles can also lead to a cycle that impedes learning. This problem can be solved! In this Lab, join Laura Monaco Torelli to learn and practice the skills that will help your clients bridge this learning gap including Contiguity, Fluency Activities, and more So Join Laura and bring the learning home! Although you may refuse to use shock as a dog-training tool, some of your potential clients have used it (especially in the United States). Some clients will want to continue using it, in lieu of your suggestions of positive-reinforcement alternatives, or, possibly, in addition to them. That’s a hard reality. Each dog-care professional must decide how to respond to this dilemma. In deciding, it’s helpful to understand the unique power that shock has to damage the psychological well-being of animals—and the power it has to deceive users regarding its efficacy. Join Kathy Sdao as she helps you think through a few of the complexities of this emotional and crucial issue for anyone with clients. To see all of the Expo courses focused on teaching others, refer to the TEACHING OTHERS track label on either location’s conference schedule. See you at ClickerExpo!